Standing at a height of 6,288 feet, in a region that's perhaps better known for quaint New England hamlets and rolling farmlands rather than screaming winds and mummifying temperatures, New Hampshire's Mount Washington is a peak that defies typical weather patterns in the region. The weather you’re likely to experience on top of this peak’s exposed, rocky summit often falls into the same categories as the weather you might find nearly five times higher atop Everest, or thousands of miles north at the North Pole. For nearly a century, the mountain held a firm grasp on the world record for the strongest recorded wind speed—a searing 231 miles per hour—and still today settles for second, with the fastest overland wind speeds outside of a hurricane. It’s seen temperatures drop as low as 47 below, it once received 47 feet of snow in a single season, and it received a whopping 10 feet of rain in another. Its hulking mass towers over the lowlands and over other mountains surrounding it, giving it the appearance and exposure of a taller peak. During the winter you can spot it from a distance, white from head to toe and with a top typically shrouded in clouds, or at least with a plume of snow blowing into the atmosphere. But the fatal conditions (close to 140 people have died at Mount Washington since the 19th century) that the mountain is known for have a hard time scaring too many adventure-seekers away from its slopes, and that's largely due to the opportunities for winter recreation the mountain is home to. Scores of hikers take to the peak’s more tame trails while others climb more steeply up the icy lines streaking from the base nearly to the summit. The mountain is surrounded by classic gullies and ravines for backcountry skiers and boarders, while its snowy shoulders are ripe for long tours. 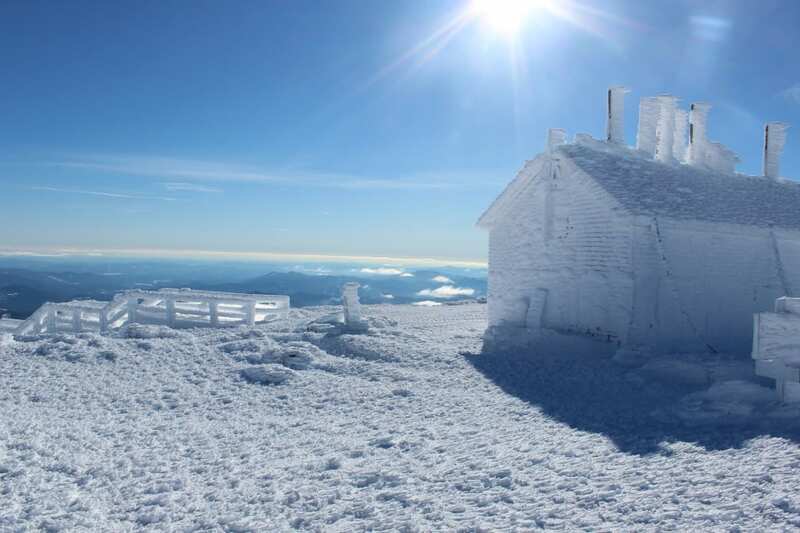 Nearly every winter activity has a place on Mount Washington. 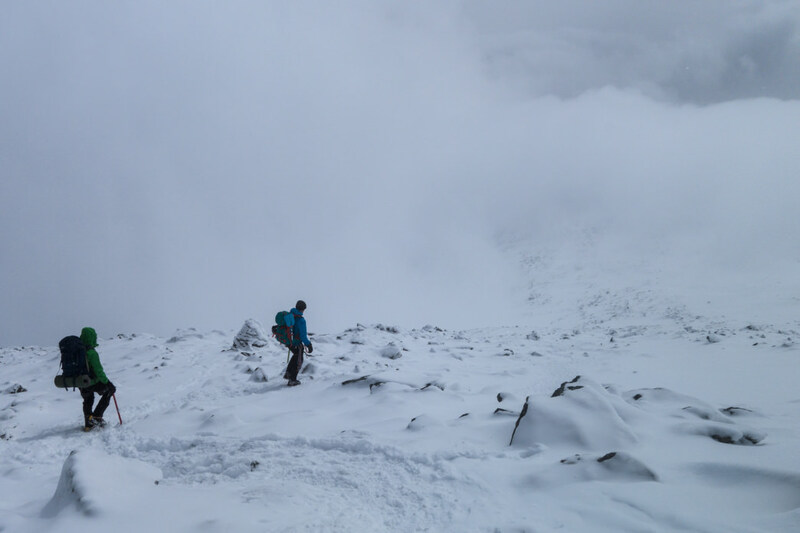 When combined with the extreme weather, is turns the mountain into the “Rainier of the East,” a proving ground perfectly suited towards training for mountains that, although they may be far larger, would be hard pressed to appear more extreme. Skiing, climbing, mountaineering, and expedition skills transferrable to the big mountains of the world can all be picked up on Mount Washington, if you know where to look. Especially during the winter, even a hike up Mount Washington’s snowy slopes becomes a committing mountaineering endeavour. The most popular winter line is less than 4 miles from bottom to top, but it climbs for over 4,200 feet, much of which is above the treeline, leaving you exposed to everything the mountain has to offer. You would be wise not to take this on without an ice axe and crampons. From Pinkham Notch, the wide Tuckerman’s Ravine Trail switchbacks calmly to the ridge separating Tuckerman’s from its neighbor, Huntington’s Ravine. From there, the Lion Head Trail winds to the exposed crest of the ridge. From here on out, you’re liable to feel the full force of the mountain’s record breaking winds. From the rocky trail, you can peer into Tuckerman’s as it seems to swallow half the mountain, before the trail meets the base of the peak’s gigantic summit cone. 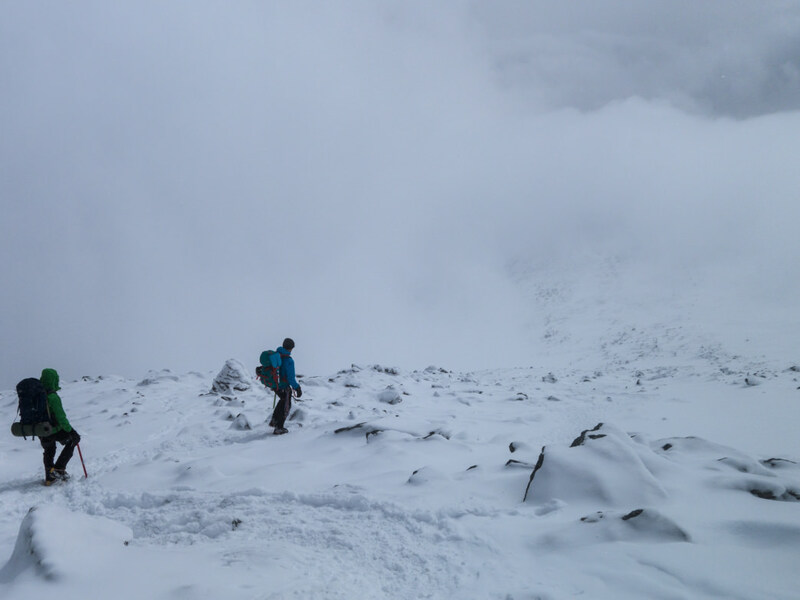 The final less than a mile is relentless, and the conditions only get stronger until you’re on the summit. The two gorges on either side of the Lion’s Head Trail are equally popular hotspots for winter activity. Huntington, to the north, is best known for it’s uphill routes, while Tuckerman’s is better known for the descent. 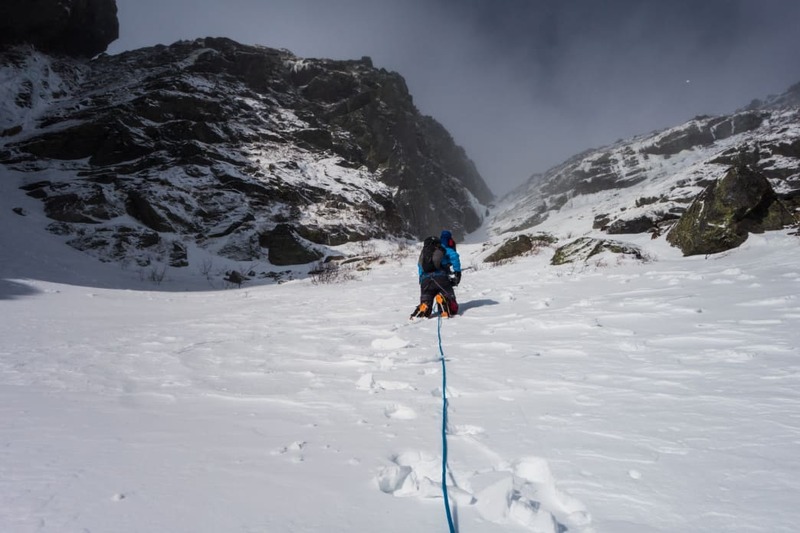 Ice climbers and more serious mountaineers looking for long, steep alpine lines should head into Huntington, where you’ll find a collection of serious gullies: Narrow scrapes in the steep rocky walls, some as tall as 1,000 feet, filled with nothing but ice and spindrift. An ascent up one of these pits you against hard, brittle ice, difficult and technical climbing, avalanche conditions, and a consistent pummeling of ice and snow, whipping straight down from the alpine tundra above, transplanting you to the steep lines of the Alaska Range. 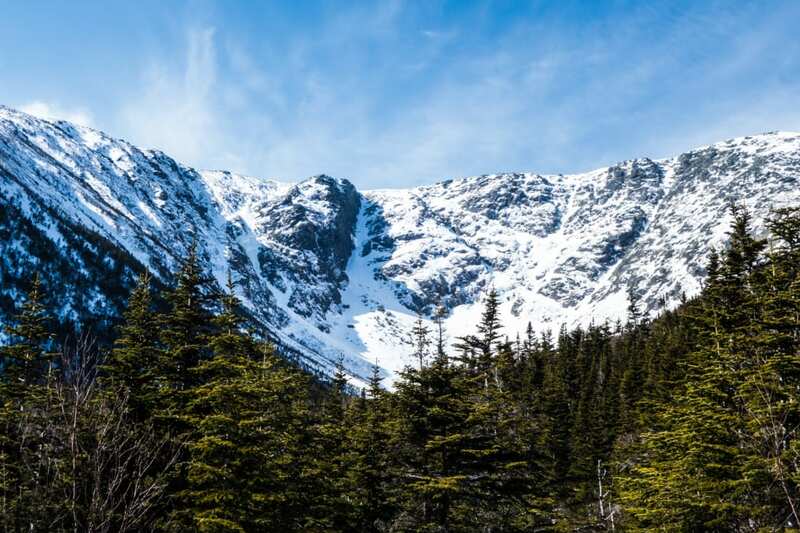 To the south, Tuckerman’s Ravine is world-renowned for backcountry skiing. Unlike Huntington, Tucks fills with snow more evenly, allowing skiers and riders to float up across the Alpine Garden, then drop nearly vertically over the lip and sail more than 500 feet down 65 percent slopes. Of the more than a dozen lines around the bowl and slightly farther down the ravine, none are beginner friendly, forcing you to navigate at high speeds around rock bands, icefalls, and crevasses, and the threat of avalanches is as real here as anywhere else, but when the spring sun starts to soften the snow, Tucks might be the capital of American corn snow skiing. Camping out during the winter on Mount Washington is akin to setting up on the Patagonian Icefields, but that’s not your only option. In Huntington Ravine, Harvard Cabin is a cozy respite from the bitter winds of the ravine floor, just a short walk away. Caretakers keep the wood stove stoked, there’s a stovetop for patrons’ dining pleasure, and the loft above is a comfortable and warm hangout for the burliest of ice climbers and skiers. 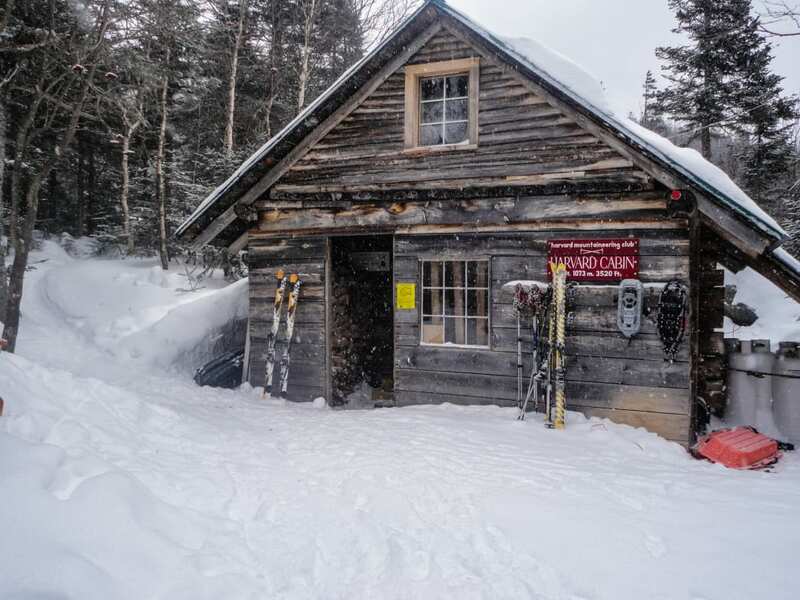 In Tuckerman’s, a collection of shelters at Hermit Lake will get you out of the wind and drifting snow. Both the Hermit Lake Shelters and Harvard Cabin require registering at Pinkham Notch before the trip uphill, and cost up to $15/person. Traveling into the mountain’s snowy areas requires avalanche training and knowledge of the current conditions. Ravines like Tuckerman’s or Huntington are funnels for snow, but even the comparatively mellow snowfields of the summit cone have been known to tear loose with massive slides. Part of the danger of the mountain’s weather is in its volatility and ability to change rapidly. During the winter, no matter the current bluebird skies and clear forecast, expect that it can suddenly shift to hurricane-force winds, subzero temperatures, and a total whiteout at any moment. Be prepared with the clothing and gear to match and always have a quick escape route below the treeline handy. The summit is home to a staffed weather station and observatory but don’t expect hospitality. Observers typically lock themselves away during the winter and the facility can not be counted as a shelter.